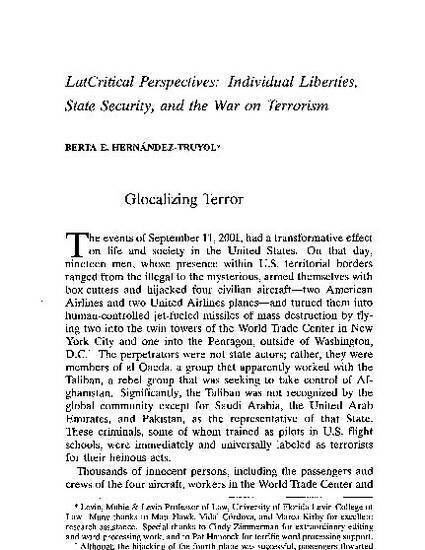 This overview of the events of September 11 and the series of domestic and international responses thereto--legal, military, and political--intertwine the global and the local, effectively glocalizing terror. Foreign forces united to effect a military strike against the Taliban and al Qaeda in Afghanistan. Captives from numerous countries are held by the U.S. military on a base in Cuba. Assets have been frozen in financial institutions around the world. The global and local lines are blurred or trespassed, depending on one's point of view, by collective enforcement against terror as well as by unilateral actions that, while seeking to bring justice against terrorism within one state's borders, threaten the (international) human and (domestic) civil rights and liberties of citizens and non-citizens alike, both at home and abroad.